Sometimes it’s just one ingredient that can make a dish spectacular. Whether you’re grilling them and serving them on a bun or using them to add some kick to a sauce, soup or appetizer, our hot Italian sausage patties are all you need to take your dishes to the next levels of taste and satisfaction. 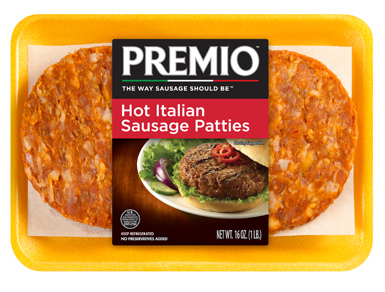 With an ideal amount of invigorating heat, Premio Hot Italian Sausage Patties are the way spicy sausage should be. Ingredients: Pork, Less than 2% of the following: Sugar, Water, Salt, Paprika, Spices (including red pepper & fennel), Potassium Chloride, Natural Flavors, Extractives of Paprika. 15-20 minutes. Use spatula to turn patties often until golden brown. Serve and enjoy! Heat a pan to medium temperature. Add 3 tablespoons water and place patties in pan. Cover the pan, continue heating for 10-12 minutes, turning the patties often. Remove cover and continue cooking for 15-17 minutes or until golden brown. Serve and enjoy! Cover the patties or place in a closed container. Refrigerate and serve within 2-3 days. Heat sausage patties approximately 1 minute on high or until warmed to your satisfaction (adjust time according to your microwave). Satisfy the meat and spice lovers in your family with recipes made using Premio Fresh Hot Italian Sausage Patties! Surprise everyone and serve up burgers with a spicy kick to ‘em! In fact, spice up all your usual meat recipes with these hot sausage patties and soak up the compliments for your cooking prowess as they come. For your next Sunday dinner, combine Premio Hot Italian Sausage Patties in a lovely Italian Pasta Sauce and Chicken Meatballs … YUM! The extra spiciness is guaranteed to send your taste buds into a frenzy! If you’ve enjoyed Premio sweet or mild Italian sausage patties before, we have a feeling you’re going to love our hot Italian flavored sausage patties. Our hot Italian ground sausage patties have all the great flavor of our mild Italian sausage patties, but with an extra kick that comes from a generous addition of red pepper flakes to the spice mix. The result is a taste sensation you’ll want to enjoy over and over again! Looking for a way to put a new spin on breakfast? Sausage links with your eggs are great, but sometimes you want a little variety. Use our hot Italian sausage patties to make a great spicy breakfast sandwich with eggs, cheese and a biscuit or English muffin. It’s just the thing to wake up your taste buds and your body to help you get a great jump-start on the day. Ready for a twist on your typical hamburger? Dress up your hot Italian sausage patties on hamburger buns with the works for a porkburger you won’t find at any fast food joint. Trying to find a new take on dinner? Some hot Italian sausage patties with grilled peppers, onions and rice can create a new dinner sensation that could become a regular on your home menu. Why Choose Patties Over Links? So why should you choose our Premio hot Italian sausage patties over our classic links? Well, first of all, you don’t have to! You’re free to enjoy both our hot Italian sausage links and our hot Italian sausage patties depending upon your mood. They don’t get jealous of each other. But why would you choose one or the other? The most obvious reason is the shape. A sausage patty is perfect for a sandwich. Slip it on an English muffin for an instant breakfast sandwich or a hamburger bun for a twist on a standard burger. Links go better on their own, next to a pile of eggs or perhaps in a hot dog bun or a baguette. Then there’s the texture. Biting into a sausage casing is a very specific taste sensation. Some love it and some don’t. Again, there’s no right way to enjoy hot Italian sausage meat. Finally, the taste. While both hot Italian sausage patties and links have a great, spicy taste, patties tend to brown faster and all around the outside, while links give you a lightly browned casing when cooked correctly, giving you a slightly distinct but always engaging flavor. Some prefer patties to links, some links to patties, while others enjoy both. It’s all up to you! Use our store locator to find where our Italian sausage is sold near you!